Susan Bean's spirits are on the mend. Cannon County Country Christmas is the next thing on the agenda for the Bean Patch after weathering the Nov. 1 fire on the Square. "It's the Bean Patch, not the Bean Pot. I've even had someone call it the Bean Bag," laughed owner Susan Bean. Mrs. Bean's spirits are on the mend after nearly a week of hard work overcoming the problems caused by the fire. The tragedy taught her a lesson about Woodbury. "It says a lot about the community. I saw a lot of faces I knew and a lot I didn't know and they were all helping," she explained. Those helpers managed to remove the goods from her shop and preserved them from damage from the heavy smoke. Everyone just pitched in and helped. "Huff and Puff really saved us," she said. The Cannon County-based trucking company loaned a trailer to the Beans for temporary storage. "We just moved everything to that truck," Mrs. Bean said. "We've had lots of help, taking it out and now bringing it back in." Once the fire was extinguished, a crew from Servicemaster cleaned up the smoke and water damage. "They did a great job," she said. There was never a doubt that the Bean Patch would reopen. "It was a lot of extra work, but I've lived long enough to know that you take it as it comes," Mrs. Bean said. 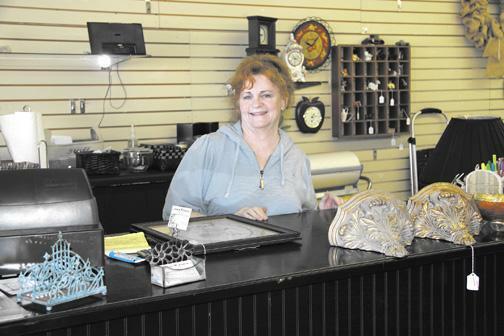 "We've still got some work to do getting stuff back into the right place and some of our consignment people still have to bring some items back to the store," she said. "I'm looking forward to having our customers back." The store features antiques and what Susan calls "uniques" in other words home decorating items that might not be old, but are unusual. "I have a lot of home decorating stuff, including lots of homemade items. My husband (Tom Bean) loves to work with wood and has a couple of tables here." So what's next for the Bean Patch? Getting ready for the Country Christmas is top of the agenda. "Tom has made a miniature train track for my front window," Mrs. Bean said. The Christmas train layout features a miniature version of Woodbury's Square with the Courthouse in the middle. The train track even runs through a homemade version of Short Mountain. The layout has a passenger train and a freight train. "I know people will love seeing it," she smiled.